Print your designs on our custom neoprene and have fun on your next creative project. Spongy, flexible and water absorbent, there's a myriad of uses, from a neoprene gaming mat for children to being used as wetsuit material. Your unique designs are printed all over in bold, high definition print that won't peel or crack over time. To print on Neoprene, we back it onto a white, jersey poly face that has a slight sheen. This remarkable material is superb for printing and fabricating into bags, accessories, tabletop or floor Neoprene gaming mats and even garments. Whatever you're planning on making, the print results are excellent with fine details showing clearly. Please not, our Neoprene is printed in sheets, not in rolls. I am so pleased with all of my prints so far. Your quality control is excellent. Thank you! Despite being so tough and durable, it's a fussier fabric than most as it needs a delicate, cold wash or a dry cleaning job to maintain its excellent condition. Give it a cool tumble or hang to dry. It's iron safe up to 120°c. What Can I Make With Neoprene? Neoprene mat: Whether it's a baby playmat, UK wargaming mat or a tabletop mat for comfort, this fabric is perfectly suited to the job. They are perfectly flat, durable and silent for when you're moving pieces or throwing dice. What's more, it's light and easy to transport, so roll it up and lay it down in seconds ready for play. Neoprene handbags: Being sturdy and opaque in nature makes it a quirky material to use for bag making. You could even use it just for the face of a bag if you've got an existing one that's in need of a makeover. Laptop covers: The protective padding is an ideal solution to finding the best protection for your devices. From Kindles to tablets, you can stitch together a custom made sleeve made from this lovely material. Neoprene fabric for clothing: Designers like to make neoprene clothing such as printed skater skirts, as it holds the shape so well. We also have some customers making gym or sports jammer shorts, couture jackets and even custom neoprene dog vests. 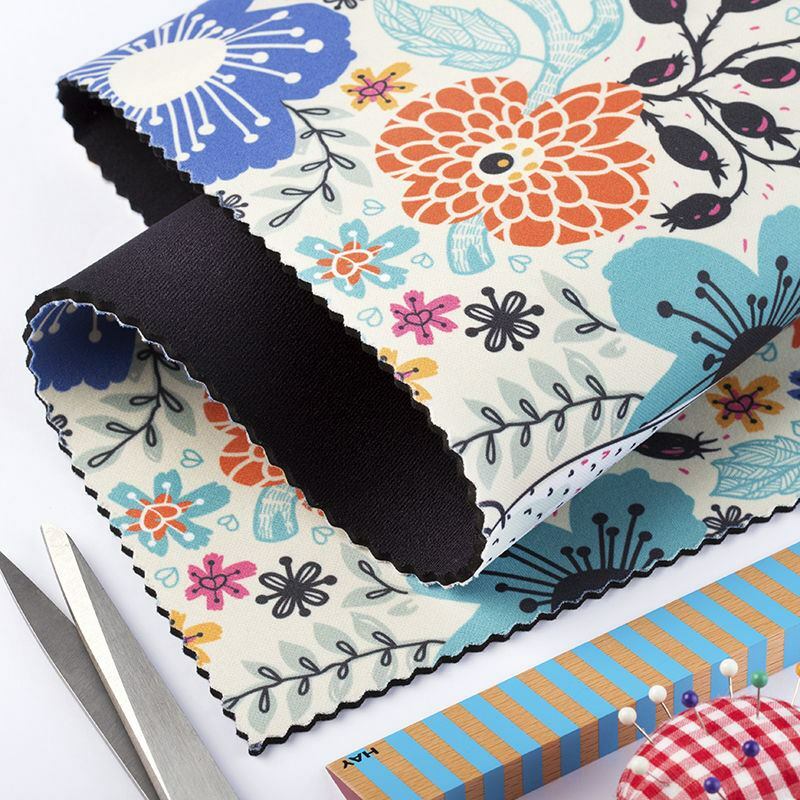 Important: Before measuring and ordering your Neoprene fabric, it's essential you refer to our hemming and shrinking information to avoid disappointment and order the accurate amount for your project. Due to the natural, thick structure of neoprene fabric, we are unable to offer our hemming service on this particular textile. We print your designs onto neoprene sheets and cut them to your specific dimensions, finishing the edges either cut on the line or left as they are. The dye sublimation process we use is a specialist technique, bonding the ink to the white jersey face creating an everlasting print. If you prefer, we can also supply you with the plain Neoprene left unprinted, if this is what your crafty project requires. Please note: the thickness of the neoprene can vary from 2-4 mm. Due to the fabric, we advise against high contrast graphics e.g. black text on a light background. Instead, we've found that the best artwork for neoprene is patterns of low contrasting colours with no large areas of solid colour.